Rome wasn’t built in a day; it only took about two hours. At least in Stronghold Games’ Porta Nigra. You are a builder in ancient Rome. But you want to be a Master Builder, known as the greatest in the Empire. To claim that title, you’ll work to construct four Roman structures, including the titular city gate, the Amphitheatre, the Basilica, and the city wall, faster and better than your opponents. Your main task is collecting different colored bricks and placing sets of the same color on the limited spots among the four structures. This involves riding a horse around a marketplace for colored bricks. So even if nothing else appeals to you about Porta Nigra, you’ve got the whole horsey thing going. Each turn, you’ll play one of the two cards in your hand. Cards have a variety of actions available, and you’ll select two or three (depending on the card) to carry out. There are only a few options throughout the entire game - acquire a single brick, collect a scroll (AKA influence) used to purchase special cards in the illustrious Honours cards market, place a building, take a torch (bonus action), or snag some coins. The gameplay is simple. In fact, you’d have a hard time finding a more easy-to-learn Eurogame with this much depth. But easy to learn and easy to master are two different things. Porta Nigra has a brilliantly devised cost/benefit structure that puts it among the elite Eurogame’s available today. See, you may be pooling a collection of red bricks with an eye on placing a towering six-brick structure on Porta Nigra. You want more, and fortunately the card you just played has an option to buy one brick of any color. However, your builder is in a different quadrant of the brick marketplace and must travel to get to and buy the red brick. This could cost up to three extra coins. And coins are not plentiful in most playthroughs of Porta Nigra. Not to mention the red brick itself costs three, making it more costly than say the always-on-sale 1-coin black brick. Is it worth the extra money to get over to the red district and buy that brick? That depends. Does your opponent also have a stockpile of red bricks? Could they beat you to one of the few red build spaces on Porta Nigra? If all are claimed, you ‘re going to have to build somewhere else, which might not be as advantageous. Oh, and there are limited bricks in the marketplace. Sure, they refill whenever the total brick count goes below seven, but there’s no guarantee there will be red bricks left in a few turns when it’s less costly because your horsey is closer to collect. Another factor in this decision is a nifty set-collection mechanic. There are building cards set out, available to anyone who meets their criteria. They will show one of the four structures and a color next to it. If you place that red building in Porta Nigra and there is a Porta Nigra card with a red brick on it, you get to claim that card. Collect a set of the four structures (color doesn’t matter outside of qualifying to take the card) you net some serious bonus points at game’s end. And you can go to the Honours Card market and upgrade your set for even more points. You also have to have an eye on where the majority of victory points comes from – bonus scoring at game’s end. At the end of the game, you’ll look to see who has the most buildings on each site. Here’s the catch. Some sites have a single row, some have more. You get bonuses based on having the most buildings in Row A, then separately judge the most in Row B, etc. So, when placing that red building, you also have to think strategically about which row you want to place it in. Do you challenge an opponent who already has two buildings in Row A? Or do you go for a less lucrative row simply to assure you come out on top and score some points? 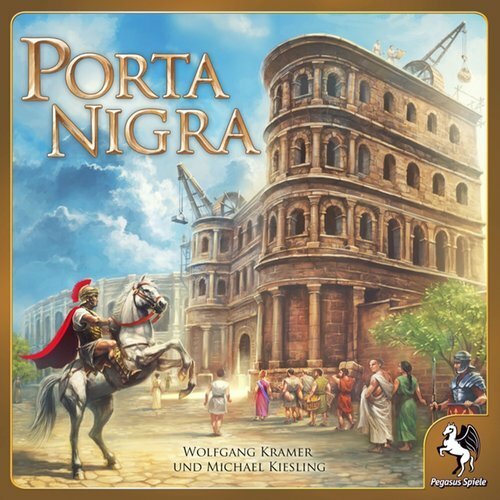 Porta Nigra finds the perfect balance between forcing you to think about immediate success (claiming the last blue brick spot in the Amphitheatre, for example) and long-term victory. At the end of a game, after all the points are tallied, it’s easy to look back and realize that if you’d just swapped the order of your choices, or hadn’t spent so much money chasing that giant red brick monstrosity in Porta Nigra, you might have eked out a win. Porta Nigra is so determined to make success or failure centered on choice that it has one of the most ingenious end-round options. Keep in mind that in a 3-4 player game, there are only two rounds in Porta Nigra. So this will only happen once in an entire two-hour game. At the end of a round (after everyone has played all cards from their deck), each person counts up the number of their bricks placed on the board. Multiply this number by two and then prepare to make a tough choice. You can divide this amount any way you like between victory points and coins. Go all in on one or the other, or mix it up however you like. Let’s say you have 24 points to spend at the end of a round. If it sounds like a no-brainer to boost your victory total, consider that coins are hard to come by – and you need them to purchase bricks and move your horsey around the marketplace. You often spend an action to claim some coins. So if you had a stockpile, you could maybe use one extra build action the next round. That could prove the difference between victory and defeat. It’s actually one of the hardest choices you’ll make in a game of Porta Nigra. If you hate games with chance, Porta Nigra might just be your dream experience. Yes, everyone draws cards from their deck, creating some randomization. However, everyone has the same set of cards, so you’ll always have an equal opportunity throughout the course of a round. And the cards in the Scroll Market are also random, but these are minor moments of probability. Winning and losing in Porta Nigra is on you. If you get crushed, it’s because you made bad choices. If you win, you earned it. Personally, I like randomness in my games. I think chance forces you to think on your feet and adjust your strategy. A game so heavily Euro doesn’t always appeal to me. And yet, I love Porta Nigra. It’s Stronghold’s best game to date. The game’s only failing is in not having more rounds. An hour for a round is a long time before a break. And by break, I mean that time where you can properly evaluate your status, reset your thinking, consider how you will use your cards for a final push towards victory. I think there is a very real, and in the case of Porta Nigra, an undervalued benefit in having several rounds in a game. It’s a refresh for players, a way to reset. There is a round marker in Porta Nigra. It’s a guy heading down a river on a boat. He moves once in two hours. He’s the laziest boat captain ever. You know you have a quality board game at the table when the one complaint is that there aren’t enough rounds in the game. Porta Nigra is a wonderful Eurogame, expertly balanced, and completely fair in how it determines the fate of its competitors. Win or lose, it’s not because of chance. It’s the choices you make and your opponents’ ability to react to those choices that determines the ultimate victor. Great cost/benefit system that makes choices matter. Rounds go on too long. No suitable for anyone suffering severe analysis paralysis. Easy to feel like you’ve lost before the first round ends. You want something that’s easy to teach, but has some real depth. You’re looking for an intense, strategic experience and don’t mind a little analysis paralysis.